This year we were overjoyed to have so many former crew members join us for Intrepid’s 75th commissioning anniversary. 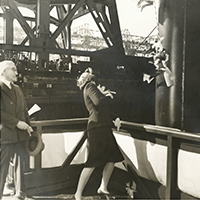 On April 26, 1943, a few months before the commissioning, this historic ship was christened Intrepid. 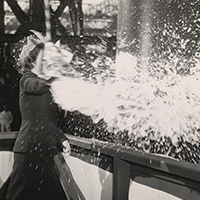 A christening and launching ceremony is an old U.S. Navy tradition which typically consists of a ship sponsor smashing a bottle of champagne (or something equally fizzy) over the bow of the ship, sending it floating into its slip for the first time. 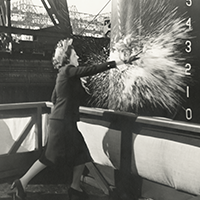 A sponsor bestows a name on the ship and wishes the crew good luck. 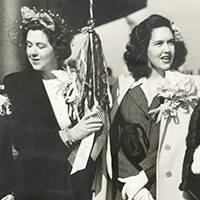 Intrepid’s sponsor was Helen Hoover, the wife of Vice Admiral John Hoover. It’s pretty harrowing to have this explosion of glass and wine richocheting back at you while you’re dressed in your Sunday best. Collection of the Intrepid Sea, Air & Space Museum. 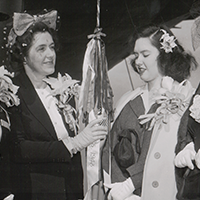 Gift of Mrs. William H. Hoover. P2009.13.08, 09, 10. 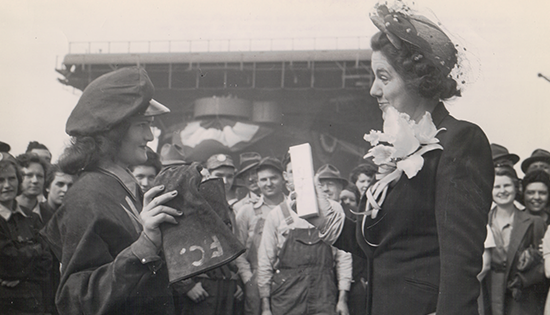 We also know that she posed for a photo opportunity with one of the riveters who helped build the ship. One artifact we never anticipated getting was the christening bottle itself. Why would anyone save a smashed up bottle? In early 2017, the Museum was surprised to be contacted by an individual who claimed to have Intrepid’s christening bottle. 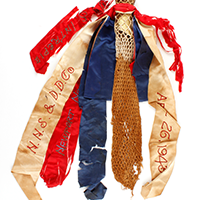 The surviving artifact consisted of the neck of the bottle, along with tattered ribbons and a mesh bag. 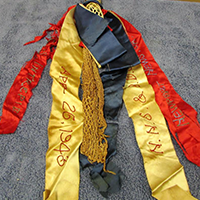 Using a combination of photos and angles, one can see that the ribbons read: “U.S.S. Intrepid,” “N.N.S. & D.D. Co.,” “Newport News Shipyard” and “April 26, 1943.” Collection of the Intrepid Sea, Air & Space Museum. Gift of Mrs. William H. Hoover. P2009.13.06, 07. Provenance is important when the museum considers an acquisition, and we were curious to know who saved the bottle and why. According to the owner, a dockworker in the Newport News Shipyard took an interest in the discarded christening bottles and saved them. After the dockworker passed away, the collection had been bought and sold through antique shops, ending up with the current owner. The Museum was delighted to acquire such a foundational artifact to the ship’s history, but it hadn’t weathered the years well. Once it arrived on site, we took a condition report and immediately sent it out for conservation. 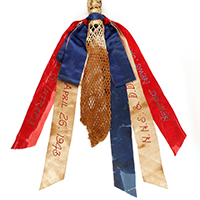 The conservators were able to clean, reinforce and reconnect the tattered ribbons using archival materials. 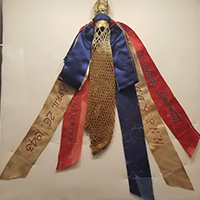 You can now see it on display in the exhibition Intrepid A to Z, closing January 14th.